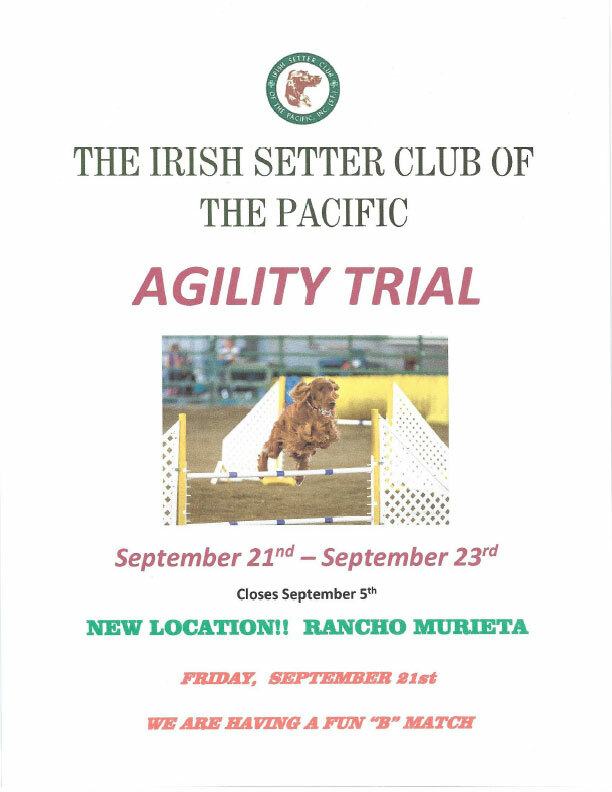 This lively performance sport has great appeal for our fun-loving Irish Setters who are amazingly agile! Like rally and obedience, both the dog and handler must work as a team to be successful. You should take classes to learn fundamentals and techniques, and then enter practice runs before entering trials. Agility is all about mastering body and voice communication with your dog as you run through judge-designed courses within specific timeframes. Handler body communication can range from subtle to bold, and with consistent training, you’ll function as a terrific team as you move through Novice, Open, and Excellent levels. In the Standard (STD) course, there are several types of obstacles, all numbered in sequential course order: tire, A-frame, dog walk, teeter, weave poles, broad jump, tunnel, chute, and different types of jumps. The purpose of this course is to test control versus speed. The Jumpers with Weaves (JWW) course only consists of jumps, weave poles, and tunnels The obstacles are all numbered by the course sequence. This course tests all-out speed as compared to Standard. FAST is a “design it yourself” course using several the obstacles from the Standard course. There’s always a bonus section where your dog must take 2 obstacles that are several feet away (laterally) from the handler. The goal is to accumulate a minimum number of points (the bonus is required) within a certain timeframe. The point values are posted on all obstacles, but the handler determines the course sequence. The bonus part of FAST tests the distance work of dog and handler. Placements and Qs (qualifying scores) are determined by your score (there are point deductions as well as disqualifications). Your goal is to have the fastest run time within your class and class height. Titles for each of the course classes are awarded after 3 Q’s per class, so you start off in Novice, progress to Open and finally Excellent. and 750 speed points. One speed point is awarded for each second the dog runs under course time when it qualifies. There are multipliers for 1st and 2nd place, so if you get 1st place in your class and are 5 seconds under course time, you get 10 speed points. 1st place gets 2x seconds under course time, and 2nd place gets 1.5x seconds under course time. The main reward in agility is having a blast with your red dog! I could really use your help the 4th weekend of September. September 2123 to be exact. It is our ANNUAL AGILITY WEEKEND. It takes a lot of work to be as successful as we have been. This year we have moved the venue from Santa Rosa to Rancho Murieta (close to Elk Grove). Why? The hotels were too expensive and Saturday nights were booked for their 3rd annual bicycle race in the vineyards. Also, many people didn’t want to cross several bridges. Rancho Murieta is a beautiful venue. Plenty of RV parking, and the rooms are quite affordable for our competitors and/or volunteers. There is a snack bar with great food! It’s a beautiful equestrian arena. As a volunteer, we would be looking for people to bring ICE, Water, and some other hospitality items. We need your help in the different rings, by setting poles when they are dropped by dogs or putting them at new heights when we change classes. Leash runners take the competitors leash and walk it from the start to the finish gate. We need a volunteer at the gate to make sure the competitor(s) are ready when it’s their turn to enter into the ring. It is FUN! So many different breeds and so many people interacting. You will see Master dogs to first timers. It can be quite entertaining. Agility is a great sport for our active dogs. I do not know an Irish that doesn’t love to jump and run…..this fits right there in their element! Not quite sure if you are ready? We are having a “B” Match on Friday night after the trial is over. What is a “B” Match? You pay ahead or at the gate and you can choose 1 or both rings to practice a course. Timed by members and volunteers. No food in the ring, but you can use toys. You will find that the agility community is very welcoming and helpful in answering questions. Contact me with ANY questions and of course to volunteer, Thank you! can be contacted through the President by telephone or email.